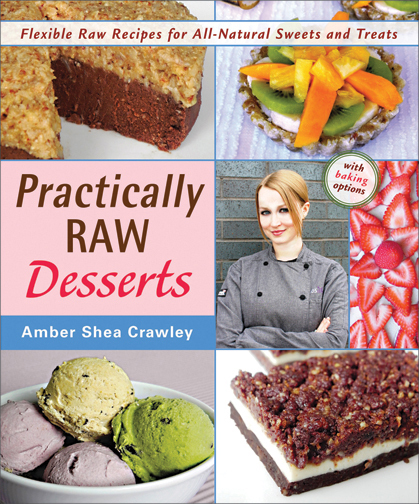 If you’ve never tried making raw desserts because you thought it may be too complicated, required special equipment or called for ingredients you could never possibly find, then Practically Raw Desserts: Flexible Recipes for All-Natural Sweets and Treats by Chef Amber Shea Crawley will change your mind. Packed with easy, innovative and approachable recipes, Practically Raw Desserts utilizes completely nutritious and wholesome vegan ingredients to create both familiar and one-of-a-kind desserts, like Carrot Cake, Mango-Pistachio Kulfi Pops, New York Cheesecake, Devil’s Food Cupcakes, Baklava Brownies and Russian Tea Cakes. If you can’t find every ingredient for a particular recipe, there are plenty of substitutions and variations offered to produce similar results (with the exception of coconut flour, which there is really no substitution for). I found coconut flour in the bulk bin at a health food store in Cambridge, but you can also buy it online. I love that Chef Amber took the time and care to ensure her recipes could be made by anyone, with almost any kind of pantry ingredients. When I received my copy of Practically Raw Desserts from Vegan Heritage Press to review on the blog, I was pleasantly overwhelmed with the array of diverse choices, and loved that there were full-color photographs to accompany the majority of the recipes inside. Although everything looked fantastic, I was instantly drawn to Chef Amber’s Salted Tahini Caramels, and it turned out to be a fantastic way to start using the cookbook. 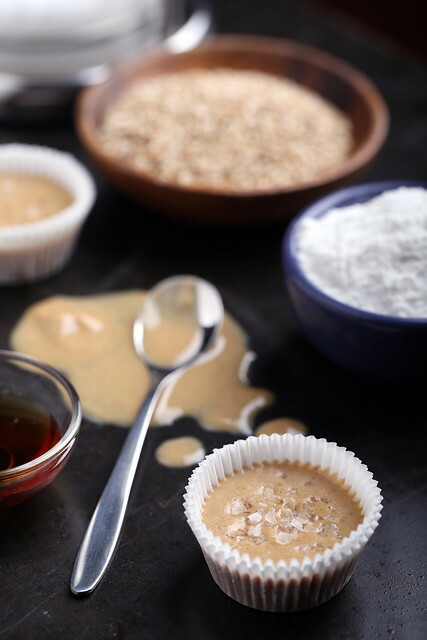 These rich and slightly salted caramels are binded together with coconut flour, sweetened with a hint of raw agave, then placed in the freezer to create an adorable two-bite dessert. These can then be placed into mini muffin cups or cut into cubes once firm, and pulled out of the freezer here and there for a cold, rich and not-too-sweet mini treat. Because I adore this simple yet flavorful use of tahini, I’m excited that Vegan Heritage Press has kindly allowed me to post Chef Amber’s recipe below. If you love tahini and lean towards a more savory and light type of dessert, then this is the perfect recipe to try out—but if you like sweet, chocolate or fruity then Practically Raw Desserts offers all of that and more. This recipe sounds fabulous! Plus, you've got to love a caramel recipe that isn't super labor intensive as so many are. Do you have Amber's first book, Practically Raw? I can't recommend it highly enough. It's a favorite around here! I don't have Amber's first book, but now I want it! These dessert recipes are also great for right now, since it's about 100 degrees in Boston, and just thinking about baking or heating something makes me shudder! These sound absolutely scrumptious!! I've been seeing a lot more recipes calling for coconut flour lately, I haven't' tried it yet so I think it's about time I did!! Made these today, tonight they're gone! Does the recipe call for prepared tahini, or tahini paste? I'm not clear. Thanks. Miriam, these two things are one and the same. The critical ingredient here is coconut flour, which will firm the tahini up properly for the caramels. Love the photos. It looks wonderful. This is such a great recipe, thanks for sharing it. 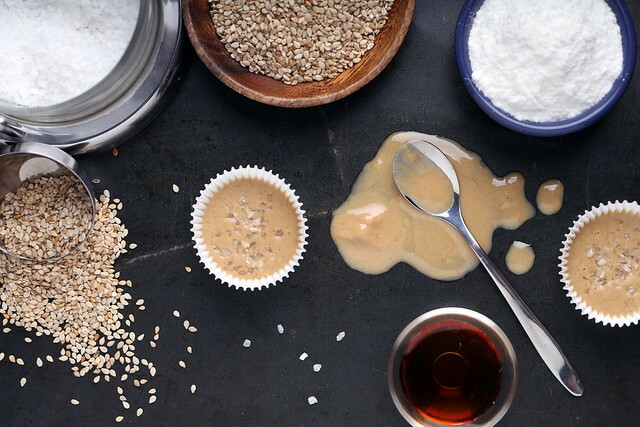 I have tried this recipe and i loved this salted tahini caramels.